So after the excitement of Lincoln Moorlands Railways FC in the extra preliminary round which was a rip roaring match we headed off to Grantham Town where a jet lagged induced snooze during their game with Dunkirk is best not mentioned. The “third round” of the FA Cup is actually called the First Round Qualifying and features 232 teams, some of which entering the competition for the first time. Well, 232 is actually 231 this year as due to the fall out of the Pakistani cricket team match fixing incident, Croydon Athletic’s future had been brought into question and so their tie with Kingstonians was awarded to the home team. Obviously, we paid a great deal of attention to the draw when it was made in late August, trying to find the perfect tie. With two little Fullers to look after as CMF was basically going out on the piss all day with her friends (I ask you – if I suggested something similar there would be a riot!) I had to balance football interest with child friendly activities. So I asked them “what would you like to do on Saturday?” “Football” was the obvious Lolly reply, but Littlest Fuller had other ideas…“Beach, cinema, bowling, shopping” “One of those?” “No all of them of course!” Now I know how her little mind works. We believe that Littlest Fuller has lived before as she is a) wise beyond her years b) a negotiator on a par with anything you see Denzil Washington play and c) devious beyond belief. So I had to work hard on this one, but soon the mist cleared and my trusted football crystal ball revealed the perfect location – Whitstable Town FC. Whitstable is one of these places that for some reason in the past decade has become ridiculously trendy. Located 5 miles north of Canterbury and a few miles west of Herne Bay, the 30,000 people town used to be a bit of a dump. I remember going out with a girl (well, I took her out for one particular purpose but that’s for another day) from Seasalter which is part of the town. Intelligent conversation was not on the menu – she worked on the checkout at Tesco and when I asked her ambition she told me it was to work on the Fags and Booze kiosk because “there was better things to stuff down my knickers”. The relationship was doomed to failure. Property prices are now some of the highest in the South East of England. A two bedroom flat (yep FLAT) will set you back nearly £500,000 if you want a sea view, or a simple 2 up 2 down in the back streets for just £325,000. It has a beach (tick), a cinema (tick), a bowling alley (tick) and fish and chip shops galore. What’s not to like for the kids? So with the buckets and spades packed, knotted hankies in hand and a promise of a few welks we headed down the A2 for a day on the English seaside. With so much affluence around you would think that its football team would be basking in funding? We all know that is not the case, as the locals prefer the more finer things in life than heading down to the Belmont Ground. But this is the FA Cup for Christ sake! Where is the passion, the hopes for a record breaking run to the 3rd round of qualifying as they did in 1988 and 1989? Where is the hope that they can repeat the amazing feat of a 4 second goal as Gerry Allen scored in 1989. 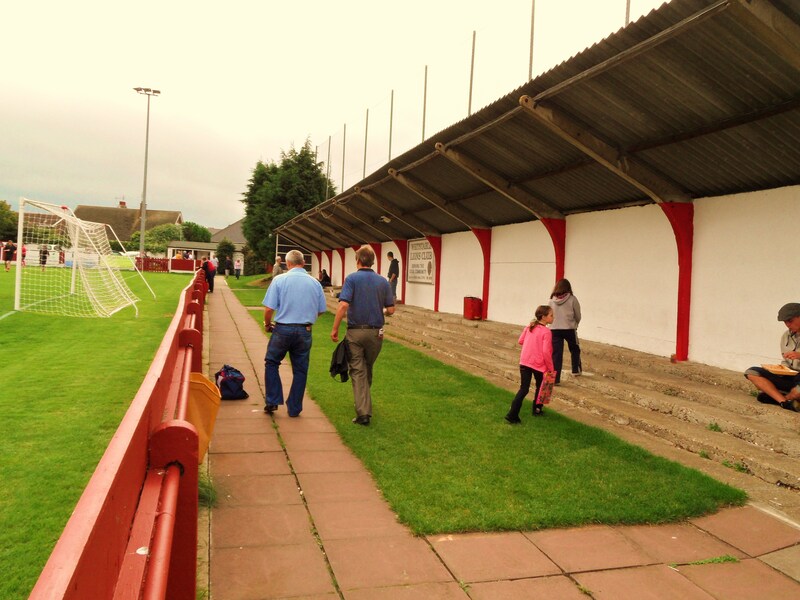 In true Delia Smith style – “Let’s be having you!” The club are another one of these who seem to be on their way up, despite the locals (who it has to be said have very little other options for their football fix in the area) not turning up. In fact during the hour we had an the bowling lane we saw a total of 16 football shirts from 5 Premier League teams yet not one Whitstable shirt – honestly! Promotion from the Kent League in 2007 saw the club enter the Isthmian League South for the first time where they have made slow progress. They have played at their Belmont Ground since 1888 – quite a record, and the ground today is a mixture of the old and new. Visitors East Grinstead Town were certainly the underdogs for this one. Whilst the Oystermen had enjoyed some success in recent years in rising out of the county leagues, the team from East Sussex were one of the founding members of the Sussex County League, and still play in the league today. The Wasps versus the Oystermen – could there be a sting in the tail? We left London with the rain pouring down, arriving an hour later in the sunshine on the North Kent coast. So after I thrashed the girls at bowling (you can only beat what it put in front of you – even if they are 7 and 10 respectively), we headed off for some lunch. Oysters all round? Absolutely not – whilst I am an international jet setter I draw the line at anything that looks as if it has been coughed up by a builder so I stuck with boring old scampi. A brisk ten minute walk later and we were entering fortress Belmont for the next story in this seasons premier cup competition, with both teams still holding onto their dreams of THAT big cup draw. Whitstable Town 1 East Grinstead Town 0 – The Belmont Ground – Saturday 11th September 2010 You should always start everything with the end in mind and so lets all give referee Andrew Parker a big round of applause for his man of the match award. It is rare you see an official get so much wrong in a 90 minute period but Mr Parker certainly did his best today. Five minutes into the game and after an East Grinstead free kick was spilt by Whistable keeper Fewell,Ross Cable managed to trick the referee into believing he had been pulled down by the keeper and earn a penalty. Fortunately good will out as they say and Cable’s weak spot kick was saved by Fewell. I took the opportunity to have a wander around the ground. Let me ask you when was the last time you saw a children’s play ground at a football match? Well, there was one here at Whitstable, hidden by a magic gate behind the dug outs. Littlest Fuller found it on one of her missions to recover a ball and we hardly saw her for the rest of the second half. The ground is certainly not one of the newest you will see in the league, but is perfect for the clubs needs. What I did notice was the smart appearance of the club officials. All had club ties on, wandering around the ground chatting to people and offering a welcome to all and sundry. The rest of the first half was spent punctuated by the referees whistle. Both teams tried to get the ball down and play on a pitch that sloped away on the far side. Half way through the second half the Whitstable subs were sent to warm up. No stretching for them – oh no. Out came their Auntie’s old cycling machine and they hopped on for a quick warm up, ignoring the chuckles all around. However, it wasn’t them who were the laughing stock as Stuart Vahid, the Whitstable centre forward kicked air in front of an almost open goal when it would have been easier to score. The second half started with not one but TWO dogs in the ground. After breaking my several year long drought on Tuesday at Carshalton by seeing a dog, I doubled my count with two in just two minutes in the ground. I now need to set my sights on something higher. Next target has to be a cow, or a pig. Whitstable started the second half in the ascendency. However it was Fewell again who was the home team’s saviour with a smart save from a East Grinstead free kick on 60 minutes. The game seemed to be heading for a replay as it entered the last ten minutes, and then it turned into an absolute classic. The opening goal finally came in the 83rd minute when Ian Pulman rounded off a flowing Whitstable move with an unstoppable shot into the bottom corner of the net. On the balance of play they probably deserved the lead, but would be the first to say that they hadn’t dominated a team from the lower division. The home team weren’t content with just a single goal and pushed forward for a second. A long ball over the top of the defence saw East Grinstead keeper Adam Woodward caught in two minds and he handled the ball. It seemed like a simple decision to everyone in the ground, but Mr Parker added more drama by having a long chat with his linesman about it. He finally showed the keeper the red card, and with no sub keeper on the bench, nor a spare shirt, it was left to the smallest man on the pitch to don a sweatshirt turned inside out to face the Whistable free kick. Fortunately it sailed over the bar, but as the visitors prepared to take the goal kick, centre back Peter Featherstone said something that sounded to us standing on the touchline as “Joey” and again Parker ran over to chat to his linesman before running back over and brandishing a second red card to an East Grinstead player in less than 60 seconds. So 1-0 wasn’t convincing, but it was a thoroughly enjoyable afternoon. The overwhelming impression of watching football at Belmont is one of Englishness. Whitstable deserves its reputation (but not its prices) as a nice day trip, but it is a shame more football fans don’t come and watch a game in the garden of England. More photos from the day can be found at our Flickr stream here. About the Belmont Ground The Belmont Ground boasts a seated stand along one side as well as covered terracing behind one goal. Within the last ten years the dressing rooms and clubhouse have been completely refurbished, a new snack bar built and floodlights erected. 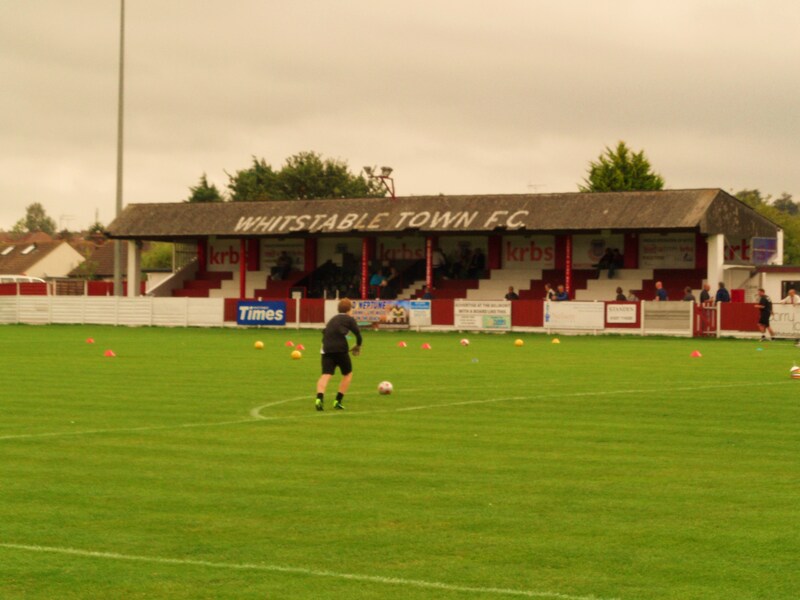 Whitstable are among the better-supported teams in the Kent League, with derby matches against Herne Bay regularly attracting 400 or more fans. How to Get to the Belmont Ground Approach East Kent on the M2 from the London towards Margate and continue to the end of the motorway at Faversham. Stay on the round as it becomes the A299 Thanet Way. (signposted “Margate” and “Ramsgate”. Continue on the A299 for approx 6 miles (passing Seasalter Marshes on your left), before taking the Whitstable turn off. Continue until you reach the Long Reach roundabout. (Long Reach) go straight ahead at this roundabout, then turn left at the second roundabout where you will find Tescos. Descend Millstrood Hill and after passing the cemetary on your right, turn left into Grimshill Road. The entrance to the Belmont Ground is on the right, 300 yards along Grimshill Road. Street parking is the best option around Belmont Road. If you are coming by train Whitstable station is a ten minute walk away. Come out of the station and turn right onto Old Bridge Road which is across the concourse. Follow this until you get to the roundabout and turn right into Belmont Road. The ground entrance is on the other side of the road just past the cricket ground. Whitstable is served by trains on the Kent Coast line from London Victoria. Journey time is around 90 minutes and a cheap day return ticket is £24. The last train back to London after a midweek game leaves at 22:39. Admission Prices at The Belmont Ground Adults are £8, Concessions are £4 and under 16’s are just £1. Programmes are £1.